For nearly four decades, The Casements Country Christmas has brought joy and good tidings to the Daytona Beach area! 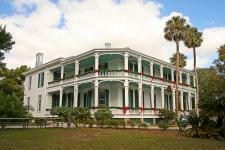 Set on the shore of the Halifax River and just two blocks from the ocean, the mansion has been called “the jewel of Ormond Beach.” This National Historic Site transforms into a winter wonderland on the first weekend of December. One $5 ticket gets you admission for all three days, and children under 12 are admitted free of charge. Enjoy special holiday décor, train rides, a Christmas tree gallery, a handmade craft room, a gourmet shop and more! 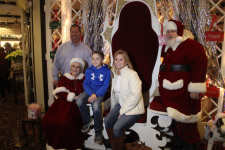 On the third day, the jolly man himself will be in attendance along with Mrs. Claus. Call 386-673-5312 for tickets. The iconic Daytona International Speedway transforms into a holiday heaven during the Magic of Lights® Holiday Display. Take the family and drive through the 1.5-mile display, which features the latest in LED bulbs and all-new digital animation technologies that have been specially created for the “World Center of Racing.” For more information on ticket pricing for vans and oversized vehicles, visit the website. The event takes place daily through New Year’s Eve from 5:30 p.m. to 10 p.m.
• Admission: $25/car at the gate; $20 in advance. Join us at the world-famous Daytona Beach Bandshell for A December to Remember! This flurry of family fun will include holiday activities, gift markets and an awesome line-up of live music, all taking place at the oceanfront venue November 28 through January 2. Bring the kids for a visit with Santa, explore the holiday craft village, jam to a tribute band, and more! 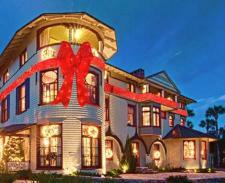 The Stetson Mansion Christmas Spectacular takes place at “Florida’s first luxury estate,” the famed Victorian Gilded Age residence built in 1886. Its original, rich architectural details make the perfect backdrop for elaborate holiday decorations, which are different each year. Designer decorations from around the world will adorn the mansion, and each room has a unique theme. Room themes for 2018 will be Angels We Have Heard on High, Oh Little Town of Bethleham, Let There Be Peace on Earth (A Tribute to our Miltary,) We Three Kings, It came Upon A Midnight Clear, Pretty as a Peacock, The Magic of Christmas and A Stetson Christmas. Visitors will be guided through the first and second floors of the home by a knowledgeable tour guide providing lively commentary as holiday music from the baby grand player piano wafts in the background. The owner/designer might stop in to say hello to your group. These enchanting tours include the 3 main bedrooms, 7 bathrooms and the secret master closet. Guides share the details of the decorations and historic highlights of the mansion including the inspiring story of the current owners extensive restoration. Just when you think you have seen it all you are then treated to a visit into the original schoolhouse which has since been converted to a Zen like cottage featuring a soaring 15 ft ceiling. The school house might offer a few gift ideas including a picture book featuring Christmas designs by JT Thompson. Experience how Stetson Mansion has decked the halls on one of these enchanting tours, which are offered daily (except Sunday mornings) through January 15 at 10:30 a.m., 1:30 p.m. and 5 p.m. Reservations are required; visit the website for more information. And, as a special holiday gift, if you come for a Christmas tour, you can return for free as many times as you’d like from February to September 2018 when you bring a paying guest! Enjoy an exceptional Christmas Spectacular Tour in this Stetson Mansion video! Take a step back in history with a DeBary Hall Historic Site Candlelight Tour. Originally a hunting retreat for a wealthy steamboat line owner, DeBary Hall offers interpretive exhibits that give a glimpse into the lifestyle of the late 1800s. During the holidays, the historic site is aglow with holiday adornments, Christmas decorations and old treasures. Explore the lodge on a candlelight tour and hear the story of the Christmas Orange, followed by refreshments. This experience is recommended for visitors aged 12 and older; call (386) 668-3840 for reservations. Holiday cheer gets a nautical twist at the Daytona Beach Boat Parade, a favorite local tradition that’s back for another year on Saturday, December 1, at 6 p.m. Boats will be extravagantly decked out with twinkling lights and holiday décor to cruise the Halifax River, and you can experience the magic free of charge. Viewers post up watch along bridges, causeways and river shorelines, and it all culminates at Halifax Harbor Marina. Christmas in Daytona Beach offers a wide variety of festive activities and holiday fun. 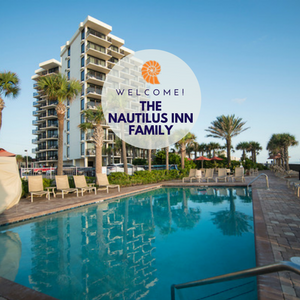 No matter which one you choose, a winter getaway is sure to put your whole family in a sunny, spirited state of mind. Start planning your trip today! 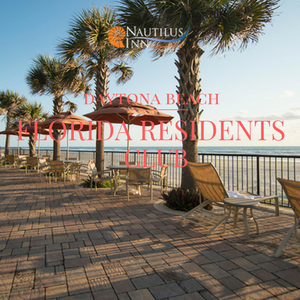 Book your Christmas vacation with our Daytona Beach Special Offers! We have to admit, there's no better way to celecrate the season than on the World's Most Famous Beach!